Written and first recorded (as “Hey Lolly Lolly”) by Woody Guthrie (1944, released 1952). Also recorded by Pete Seeger (as “Hey Li-Lee”, 1954), The Vipers Skiffle Group (sa “Hey Liley Liley Lo”, 1957), The Limeliters (as “Hey Li Lee Li Lee”, 1961). Hit version by Chubby Checker (US #12/R&B #4 1963). First recorded (as “To Everything There is a Season”) by The Limeliters (1962). Also recorded by Pete Seeger (1962), Judy Collins (1963). Hit version by The Byrds (US #1/UK #26 1965). From the wiki: “‘Turn! Turn! Turn! (to Everything There Is a Season)’, often abbreviated to ‘Turn! Turn! Turn!’, is a song written by Pete Seeger in the late 1950s. The lyrics, except for the title which is repeated throughout the song, and the final verse of the song, are adapted word-for-word from Chapter 3 of the Book of Ecclesiastes, set to music and first recorded in 1962. The song was originally released as ‘To Everything There Is a Season’ on The Limeliters’ album Folk Matinee and later released then some months later on Seeger’s own album The Bitter and the Sweet. Original English-language recording by The Limeliters (1962). Hit versions by Sandie Shaw (UK #51 1968), Mary Hopkin (US #2/UK #1/CAN #1/JPN #1/FRA #1/SWE #1 1968). 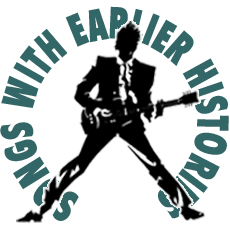 From the wiki: “‘Those Were the Days’ is a song credited to Gene Raskin, who put English lyrics to the Russian romance song ‘Dorogoi dlinnoyu’ (‘Дорогой длинною’, lit. ‘By the long road’), composed by Boris Fomin (1900–1948) with words by the poet Konstantin Podrevskii. It deals with reminiscence upon youth and romantic idealism. The song is featured in the 1953 British/French movie Innocents in Paris, in which it was sung with its original Russian lyrics by the Russian tzigane chanteuse Ludmila Lopato.